I did not know I could live in a world of my own creating, until I realized that what I am currently doing is merely echoing the world of someone else’s creating. With our power of imagination and feeling the deep sincerity of what we love to do, we are consciously creating the world we want to live in. We are doing this and it is countering the tendencies of today’s patterns of uniformity and legalism, which are not the same as universal law. Universal law is always in effect and it is always blessing and uplifting all of us. When we tune into that law and live according to it, it creates a different world for us. As a world, we are tuning into social justice and taking action to create it. We are coming up against entrenched legal, although not moral, entities which attempt to continue down their destructive paths. But morality and the the Universe’s love for all of us is becoming stronger in all of us, so that in some unanticipated way, the true delightful interests of all people, everywhere all over the world, are becoming the most powerful force of all. When we think in terms of worldwide harmony, there is enough for all, there is abundance for all, there is good living for us all. The grassroots movements which have no other resources other than this conviction are moving forward and gaining people who want to live a life-practice this way. They are creating their own resources as people join onto an idea and simply desire to express it together. Each of us who wants to bless the earth with our healing and uplifting presence is contributing to the growth and progress of this idea. 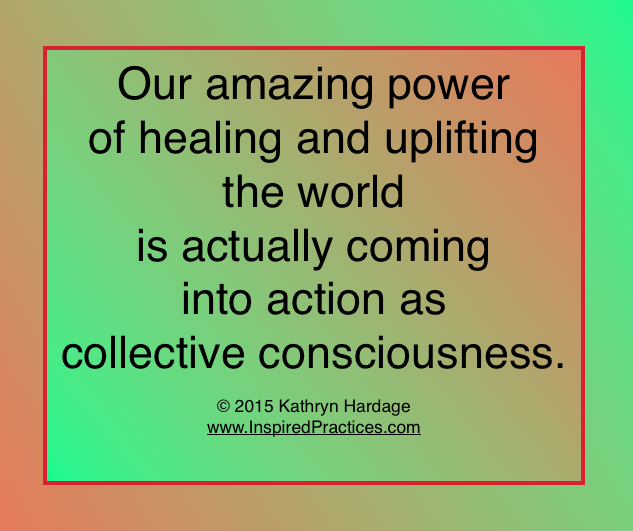 It is simply moving forward as its own healing entity with an uplifting purpose. It is having the effect of overpowering the present situation which is already imploding from its own lack of infinite resources. Blessing everyone is a purpose which has unlimited infinite resources. It is gaining even more credibility as more and more people join together in their desires and actions.